It was great to be part of the last Red Stick Farmers Market of the year and make a warming dish for the cool morning. It was even better to see people young and aging, try something new and for most, find something they enjoyed and would like to try making at home. Let me just say, the quality of lamb from Our Family Farm, the Fekete Farm and Morrow Farm vegetables and the spices from Red Stick Spice Company made all the difference. Since this will be my last post until the New Year, I wish you all a happy holiday season and inspiration for memorable meals. Enjoy! 1. Peel and slice shallot or onion and garlic. Add, with the lamb, to a medium-sized pot over medium heat. 2. Break meat apart with a large spoon and brown evenly. Add 1 cup of the water to prevent sticking. 3. Peel and chop carrots and add to pot. Let simmer for 5 minutes and open the cans. 4. Add the diced tomato, paste and two cups of water to the pot. 5. Mince fresh rosemary and add to pot and add all seasonings except finishing salt. Stir and let simmer for 15 minutes. 6. While simmering, add sugar and rice wine vinegar to a bowl and stir until sugar dissolves. Peel two medium large turnips leaving green stems attached for stability. Score the turnip into fourths without removing the stems and then slice over the bowl using a mandolin on the thinnest setting. (If you do not have a mandolin, you can use a box grater or a potato peeler to make ribbons of turnips.) Season with salt and pepper, stir and set aside to steep. 7. 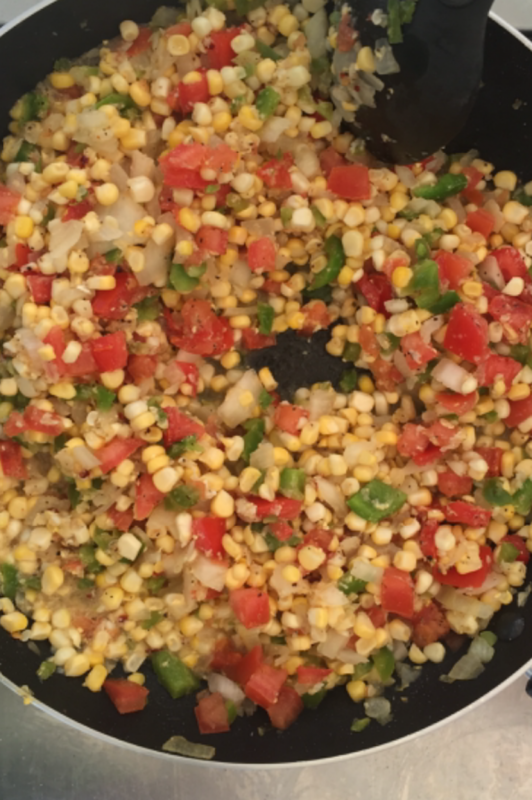 Shuck and rinse corn. Cut off cob into a bowl or on the cutting board. Add to the pot. 8. Rinse a few leaves of kale and Swiss chard and rip or cut leaves from the stems. Slice into thin strips and wilt in greens one cup at a time. Add remaining water if needed. Let simmer for 5-7 minutes then plate. 9. Sprinkle a pinch of rosemary finishing salt to each plate and top with a fork full of pickled turnips. 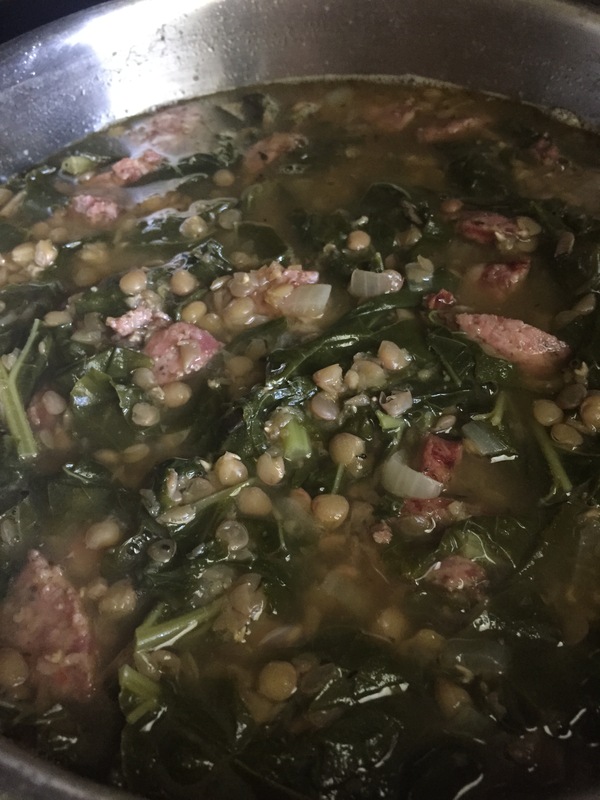 Ok, I know I said the boudin dressing and black drum recipe would be next, but with this wave of cold, my sausage and kale lentil soup is bound to meet the need for something warm, comforting and delicious! As my friends and family are well aware, I am a huge fan of the Red Stick Farmers Market which is my main source of fresh, local and seasonal produce. This morning I picked up some sausage from the Cutrer’s and kale from a Ponchatoula farmer to go with some hearty lentils and the special ingredient, dried shitake mushrooms that I previously purchased from the farmers market. 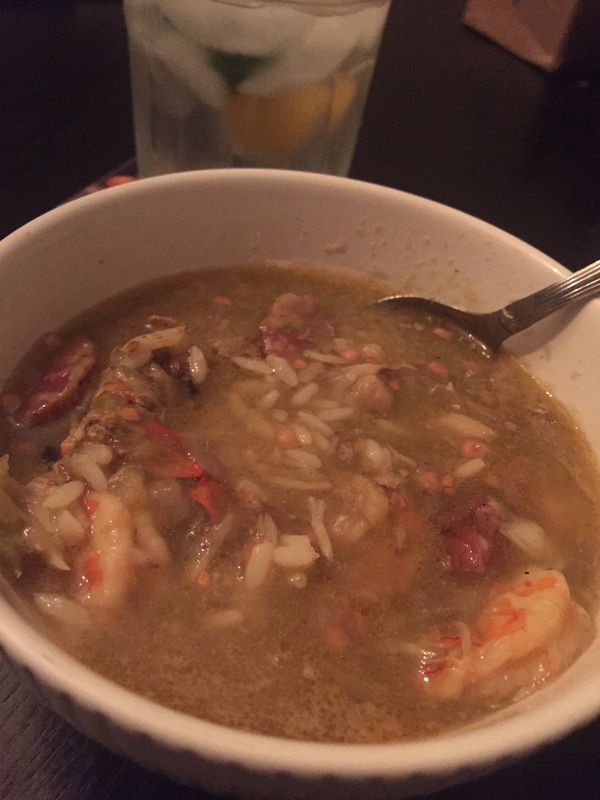 The shitakes make a rich broth which paired with the sausage, adds incredible flavor to this soup. This dish doesn’t take long to make; however I am certainly a fan of cleaning as I go because you will need a couple of pots and bowls for this one. Below are the ingredients and directions to make this dish. This makes 8-10 servings. If using whole kale leaves from the farmers market, rinse kale and place in a bowl of water, or fill one side of a cleaned sink with water and let the leaves soak to remove any excess dirt. Add dried shiitake mushrooms to 6 cups of water in a medium-sized pot and bring to a boil. Once it begins to boil, turn off heat and top it. Let it sit for 15 minutes. This will make the stock for the soup. Rinse lentils in a bowl and cover in water. Let them sit for 5-10 minutes. Dice onion and add them to a large pot over medium high heat. Add a splash of water to prevent sticking and let cook for 2 minutes. Strain lentils and add them to the pot to lightly toast with the onions. It’s ok if there is a little water from the straining process. Pull mushrooms with a straining spoon from stock and dice on a cutting board. Add liquid and diced mushrooms to the large pot of lentils and onion and bring to a boil. Slice sausage in half longwise, then dice into thin chunks. Open and add the can of low sodium chicken stock to pot, 2 additional cups of water and all of the seasonings. Bring to a boil. Once it begins to boil, top the pot and reduce to medium heat. Let it cook for 5-7 minutes. Rinse kale and chop into inch thick ribbons. Add to the pot and reduce it to low-medium heat and cook for 10 minutes. Note: This is great by itself or with homemade grilled cheese or a ham and cheese sandwich. Also, if you find you like more broth for your soup, you can always add additional water or chicken stock, to stretch the dish out.